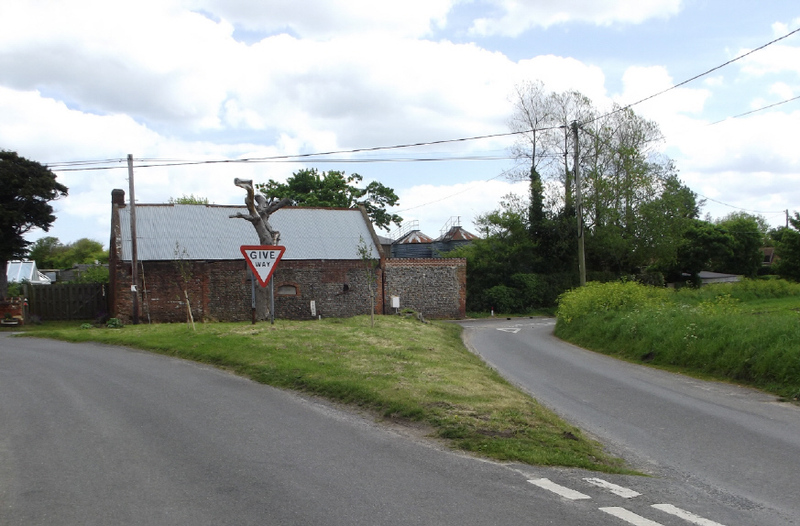 A little south of the village itself, at TG383298, is a grassy triangle with a dead tree, two saplings and a signpost on it, formed by the junction of Whimpwell Street, School Common Road and Stalham Road. This used to be known as Pump Hill, and before that, Well Corner. It is the site of one of the most well-known Norfolk ghost tales, concerning the legless and (nearly) headless spectre of a supposed smuggler. An addition to the basic tale is that, whenever the well is disturbed, the ghost walks again.2 However, the well was replaced by a pump in the 19th century, and the pump was removed altogether in the early 20th - and there have been no further reports of the Pump Hill spectre. 1. E. R. Suffolk: 'History and Legends of the Broads District' (Jarrold and Sons, 1891), p.107-111. 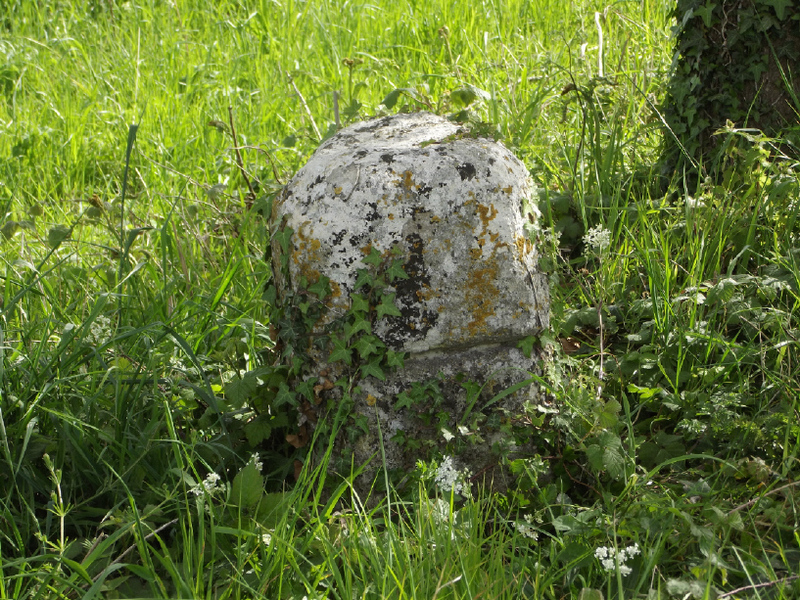 A little distance from Loddon, at the edge of a field at the crossing of three roads and a dirt track, about ½ a mile south-west of Hardley church, stands a small, shaped block of stone about 30cm square. When I first saw it, it was about 75cm high, and packed around the base with small stones and rubble (TG376003). By May 2017 only 53cm was visible above ground. On maps of the area it's marked as a 'cross-stone', but may have been a boundary marker of some kind. Once, even more of it was visible, as a record of 1934 describes it as "a square stone with beveled edges, approx. 4 feet appearing out of the ground". A tradition, probably first recorded by the local 19th century folklorist William Blythe Gerish, says that on certain nights of the year, the apparition of "an old woman in red" appears at midnight, sitting on the stone. Source: W. B. Gerish: 'Norfolk Folklore Notes' (unpublished, 1890-93), p.88. In a short alley called Stone Court just off the east side of The Thoroughfare here is a ponderous granite block, 1.4m x 1.2m x 1m high, painted black (TM246834). Commonly known as 'Herolf's Stone', it is claimed to be where a Danish Chieftain named Herolf once stood and granted several cottages (the 'Stone Tenements' in Middle Row, now gone) to the local guilds. This is said to have given the town its early name of 'Herolvestone'. Some call it the 'Harold Stone', and tell that King Harold (at one time, Earl of East Anglia) once mounted his horse here, when he stopped for the night on his way from the battle of Stamford Bridge to Hastings.1 Some say the depression in the top is the imprint of his booted foot, while others believe he stood on the stone to issue orders for the billeting of his army. 1. Letter in the 'East Anglian Magazine', Vol.8, No.8 (April 1949), p.427. 2. S. E. Dixon, in the 'Proceedings of the Prehistoric Society of East Anglia', Vol.2 (1914-18), p.171. 3. Harleston Town Guide, 1977, p.9. 4. Letter in the 'East Anglian Magazine', Vol.8, No.6 (Feb. 1949), p.334-5. Selbourne House stands just across the marketplace from the J. D. Young Hotel, formerly the Magpie. Allegedly Churchill stayed at the Magpie one night during the Second World War, where he met with General Eisenhower, who was lodging at Selbourne. A legendary tunnel running from the House to a nearby building (once the Nationwide Building Society) was said to be a particular reason that the general stayed there. "A deep hole at a bend of the stream" is how the Witch-pool was described in the 19th century, a spot on the river Waveney near Harleston that was used for the purpose of testing witches by ducking them. It is said to be haunted by spirits. Edmund Gillingwater: 'An Historical and Descriptive Account of St. Edmund's Bury, in the County of Suffolk' (J. Rackham, 1804), p.190. Robert Forby: 'The Vocabulary of East Anglia' (J. B. Nicols, 1830), p.398. Frank Meeres: 'Paranormal Norfolk' (Kindle edition, 2013. 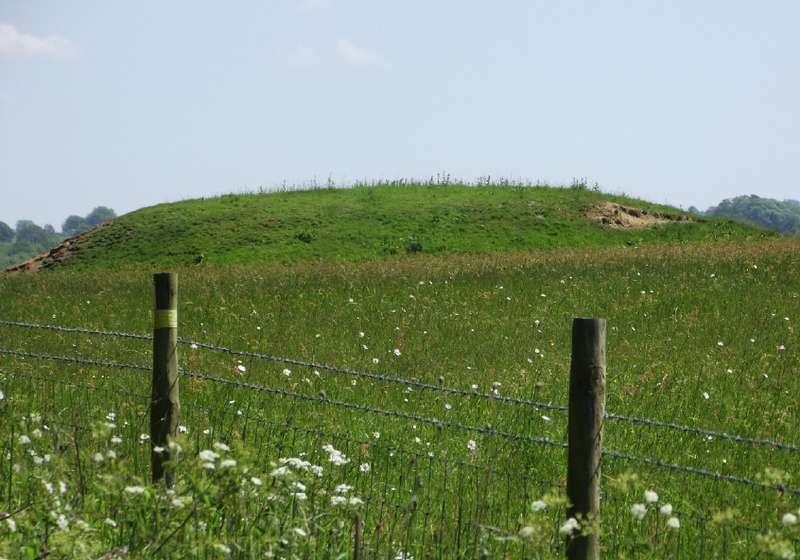 The damaged Bronze Age round barrow at TF759283 is supposed to have treasure hidden within it - but they do say that rabbits won't burrow into it, or if they do, they soon give up and turn tail! 1. Charles Lewton Brain: ‘Mounds, Mottes and Barrows’ in the 'Eastern Daily Press' 17/4/1978, reprinted in Brain’s ‘Walking on Buried History’ (Larks Press, 2009), p.37. 2. Federation of Essex Women’s Institutes: ‘The Norfolk Village Book’ (Countryside Books, 1990), p.15. 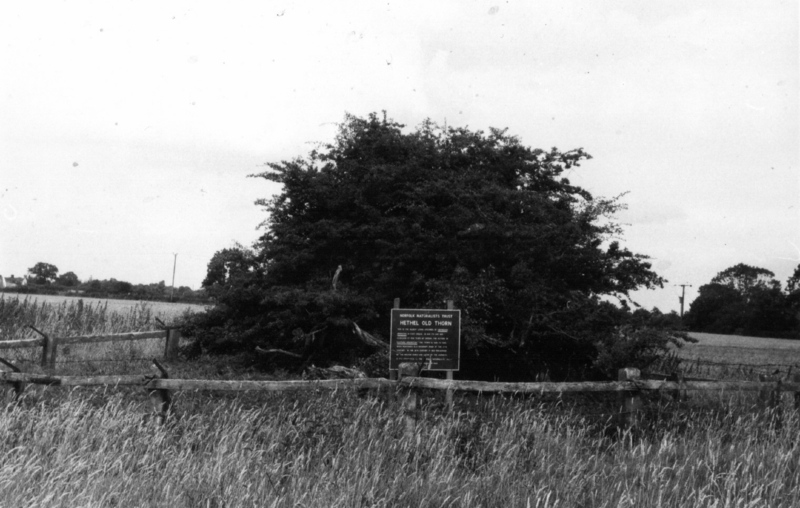 Harpley and West Rudham parishes meet at the crossroads known as Cross's Grave, so-called because a local man of that name killed himself and was buried there (TF803253). Road-menders were said to occasionally add soil to the small mound there, so that Cross would not be forgotten. However, the spot was marked as 'Adys Grave' in medieval documents. 1. C. H. Lewton Brain: 'The Icknield Way', in 'Norfolk Archaeology' (1966-9), Vol.34, p.421. 2. C. H. Lewton Brain: ‘Places and People’ in the 'Eastern Daily Press' 14/7/1977, reprinted in Brain’s ‘Walking on Buried History’ (Larks Press, 2009), p.65. Although the current Manor Farm House (TF679386, now a hotel) dates to the 17th century, local lore holds that it was built in 1580, and was first occupied by a cell of Cluniac monks from France. Unfortunately, there's little more evidence for this than there is for the underground passage said to run from the house to the ruins of St. Edmund's Chapel at Hunstanton (TF675419, see below), 4km to the north. In a meadow a little north-west of All Saints church, and reached by a path and stile, is the Hethel Thorn (TG171006). Enclosed within a low wooden fence, a plaque erected beside it reads: "This is the oldest living specimen of crataegus monogyna in East Anglia...In the 18th century it was preserved by the Beevor family and later by the Gurneys. It was presented to the Norfolk Naturalists' Trust by Mr. F. W. Myhill in 1960". Locally known as the 'Witch of Hethel', the church notes describe it as "reduced to a mere shell, and its branches are curiously convoluted....It is covered with lichen and crowned with mistletoe, but still puts forth blossoms and haws everywhere". This remarkable sprawling hawthorn is said to be mentioned in a deed of the early 13th century as a boundary marker, then called "the old thorn". In 1755 it was measured as being 9 feet in girth at a height of 4 feet, with one tremendous branch over 21 feet long. The tradition is that it was a gathering-place of rebel peasants in the time of King John. But it has also accrued the tale that it grew from the staff of Joseph of Arimathea, a tale known elsewhere in Britain, and in East Anglia at places such as Leiston and Parham, both in Suffolk. Source: James Grigor: 'The Eastern Arboretum' (Longman, Brown, Green & Longmans, 1841), pp.282-4. 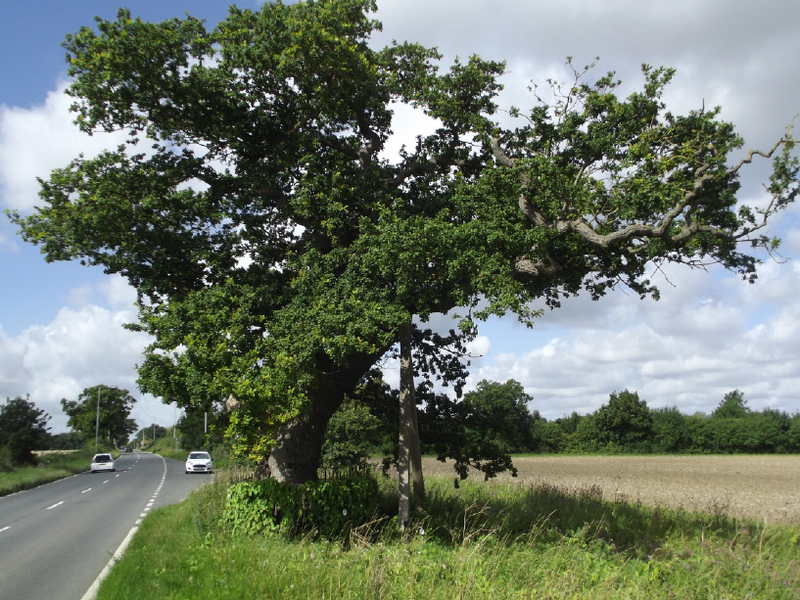 Kett's Oak (TG139037), propped, shored, and in-filled with concrete, can be found by the roadside between Norwich and Wymondham, and is well-known as the alleged spot where, in 1549, the rebel Robert Kett and his peasant army stopped on their march against Norwich to swear an oath 'to reform the Church and the State'. That, however, is the modern slant on the tale, as the tree was actually named for nine of the rebels being hanged from the tree. According to popular legend, the roots of this tree stretch out to both Norwich and Wymondham. Another Kett's Oak (TF628005) stands in a wood near Ryston Hall, not far from Downham Market, allegedly marking another gathering place of rebels from that revolt - although Kett himself was not involved with them. While besieging Norwich, Kett established his headquarters on Mousehold Heath beneath a tented or partially-roofed tree, known since then as the Oak of Reformation. Under the tree the rebels held a daily court, and here they dubbed Kett the 'King' of Norfolk and Suffolk. 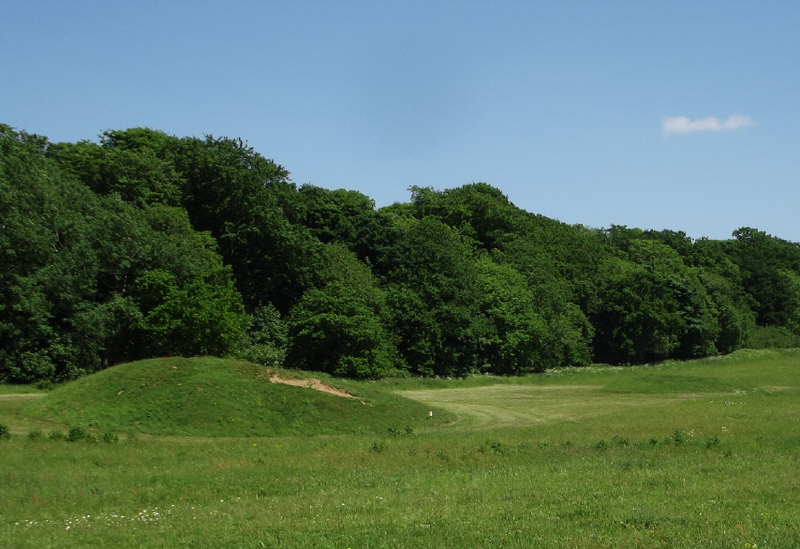 After defying the true King's forces for about eight weeks, Kett led his mob down into a vale on the southern edge the heath called Dussindale, and was there routed. Dussindale used to be thought to have been what is now the Long Valley between Gilman and Gurney Roads. However, research by Anne Carter (in 1984) and Alex Hodgkins (in 2015) has now pinned it down to the western edge of what is now the Broadland Business Park, on the boundary between Thorpe St. Andrew and Postwick (TG283092 area). The site of the Oak (TG246089) is occupied by a water tower in Thorpe Hamlet, not far from Kett's Hill. Robert was hung alive in chains from the walls of Norwich Castle (where his ghost has been seen, rotting in its swinging cage), his brother William was hanged on the steeple of Wymondham church, while nine other ringleaders were hanged on the Oak of Reformation. James Grigor: 'The Eastern Arboretum' (Longman, Brown, Green & Longmans, 1841), p.348. A rather minor tale here, with Oliver Cromwell allegedly being chased into an ancient tree by a bull. Cromwell's Oak stands at TG118275, near the B & B Stable Cottage, in the parkland surrounding Heydon Hall, which was then the home of Cromwell's lawyer Erasmus Earle. At the 12th century Augustinian priory (TG418249), now no more than fragments of archway patched into the Priory Farm buildings a little outside the village, the ghost of a hooded monk is said to prowl the ruins, then vanish into a secret tunnel leading from the site of the priory's high altar to a 'marsh drain' or dyke ½ a mile to the north-east (probably where the Hickling Wall embankment divides Brograve Level from Long Gore Marsh). In the 1940s, a local superstition persisted - at least among children - that, if you stuck a pin in the door of All Saints church (TL622981), then ran three times round the building, a ghost would appear. There was once a well here near the Lily Pond (TF999162), in a field south of Hoe Hall, in which a treasure chest was said to have been found, and as at Moulton St. Mary, the handle of the chest is now supposed to be the handle of the church door. A spring on the western edge of Spout Common (TG075387 area) used to have an enclosing wall round it (and served as the town pound), where a man was said to have tried to pen an owl overnight. An owl features proudly on the town sign in remembrance of this act. A similar tale says men of Holt once tried to pen an owl in the waterspout of the church tower (TG082388), thinking it would drown in the next rain, but of course it flew out of the top. Source: Enid Porter: 'Folklore of East Anglia' (Batsford, 1974), p.129-30. The s tatues of the Four Evangelists that stand on top of the church tower (TG355166) were said to come down one by one in successive years, then duly return. Source: W. B. Gerish: 'Norfolk Folklore Collections' (unpublished, 1916-18, compiled by William de Castre), Vol.4, p.100. Constructed on a natural mound, the Normans built a motte and bailey castle (TG205157) a little to the east of the village. From the surviving motte, an underground passage is said to run for ¾ of a mile to the remnants of a Benedictine priory at Horsham St. Faith. The priory, dedicated to that saint, was founded in about 1105, and the remains can be seen at Abbey Farm (TG215152), just north of the church. Source: Norfolk Federation of Women’s Institutes: ‘The Norfolk Village Book’ (Countryside Books, 1990), p.116. The above-mentioned priory at Horsham was originally intended to be built on a site at Horsford called Kirkescrofte. Robert Fitzwalter and his wife Sybil de Cheney had vowed to erect there a monastery dedicated to St. Faith, after believing that they had been saved from robbers by that saint while returning from a pilgrimage to Rome. 1. Sir William Dugdale: 'Monasticon Anglicanum' (Longman, Hurst, Rees, Orme & Brown, 1817-30), Vol.3, p.636. 2. Pamela Brooks: 'Norfolk Ghosts & Legends' (Halsgrove, 2008), P.69. This prophecy is remarkably similar to a riddle from Dunchurch in Warwickshire, which says that Rains Brook will run with blood after a great battle when three kings' horses will be held by a miller with three thumbs. In addition, a somewhat similar prediction appears in the writings of the Cheshire prophet Robert Nixon: "A boy shall be born with three thumbs, and shall hold three kings' horses, while England shall three times be won and lost in one day. "4 Since it's thought Nixon could have been born in either the 15th or the early 17th century, it's impossible to know which prophecy came first. And how it came to be that either of the above versions has been attached to Norfolk, I don't know. 1. Christopher Marlowe: 'People & Places in Marshland' (Cecil Palmer, 1927), p.237. 2. 'Norfolk Archaeology', Vol.2 (1849), p.300. 3. William H Harrison: 'Mother Shipton Investigated' (London, 1881), p.34. 4. 'Nixon's Cheshire Prophecies' (Abel Heywood & Son, 1878), p.7. Horstead Mill, probably dating from the 18th century but on a much earlier site, burned down in 1963. The mill pond is still there at TG267193, and on occasion is haunted by a ghostly figure. It's said to bear in its arms the body of a servant girl who drowned herself there after her lover abandoned her. The most unlikely legendary tunnels are those which pass beneath rivers. So it is here, with the river Bure standing between two churches 600m apart. 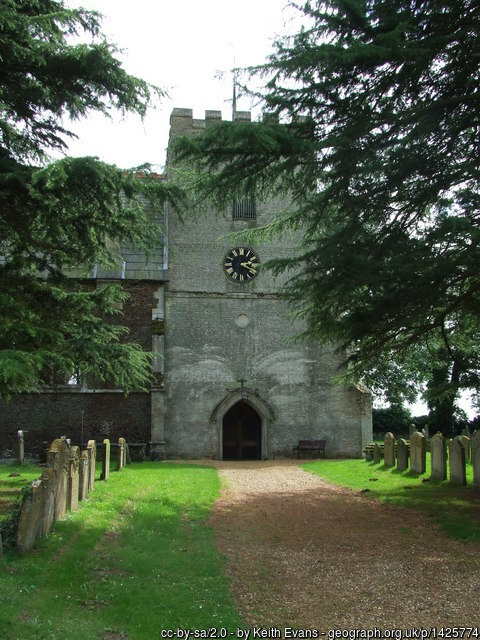 Horstead's church of All Saints (TG262199) is supposed to be linked with the now mostly ruined St. Theobald's (TG261204) at Great Hautbois, in the parish of Coltishall. A short distance from the Point are the remains of St. Edmund's Chapel (TF675419), where pilgrims offered their prayers before seeking to the holy wells which, by the Middle Ages, were said to have remarkable healing powers. Edmund himself is supposed to have built the chapel, and there spent the year in prayer before being crowned. (See also 'Edmund of East Anglia'.) As late as 1864, a young girl who bathed in the waters is supposed to have received a 'miraculous cure' for her ills. Following the story literally, the springs should be on the beach below the cliff on which the chapel stands. However, locally they are said to still flow at the site of the waterworks in Old Hunstanton, 1.3km to the north east (TF688426). In truth, they may arise in a triangular patch of woodland a further 600m to the east, at a spot marked on old Ordnance Survey maps with springs, known as The Pool (TF692426). Thomas Arnold (ed. ): 'Memorials of St. Edmund's Abbey' (Rolls Series, 1890), Vol.1, p.29. John S. Cobb: 'History of Hunstanton, Norfolk' (Jarrold & Sons, 1868), p.24.